After Katrina “Kat” Summer’s mother dies a mysterious and tragic death, Kat is hurtled into life at Apollo Beach. Her estranged and cryptic grandmother Rose fills Kat with legends of her Ancient Greek Ancestors from which the Summer family descends. Kat’s world begins to unravel as secrets from her heritage are exposed – secrets that her mother purposefully concealed. Leading to her birthday, the day of the Summer Solstice, Kat becomes frightened when enigmatic visions and disturbing dreams haunt her. When her visions become reality, her fear turns to terror as powerful forces threaten the lives of those around her. 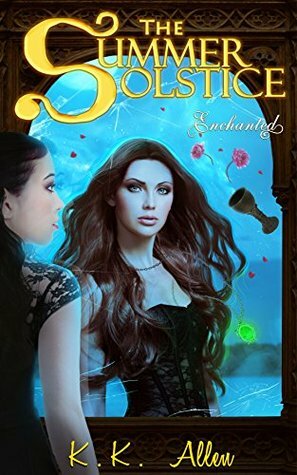 The Summer Solstice: Enchanted is the first book in the Summer Solstice series and is just a taste of much more fantasy and romance to come. I won this book in a giveaway, I actually found out I won on the first day of my vacation. Which was quite the way to start in my opinion. After reading this I have quickly become a fan of K.K. Allen and this series and can't wait to read the rest of the series. It was a quick, light and fun read that had just enough of a paranormal element to make me happy. Katrina has to move in with her grandmother, Rose, after the recent passing of her mother. Shortly after moving in with her strange things begin to happen, like weird dreams and random headaches. The first person she meets the day after arriving at her new home is Alec, the cute boy next door. Rose is keeping a lot of secrets from Kat and she is determined to get to the bottom of it but could these secrets be worse than she imagined? She starts to wonder if maybe there was a reason her mother kept her away from this side of her family for her entire life. Kat was a great protagonist and I thought she was quite relatable -minus the super cool powers that I will never have. She was a strong character and not all weepy like I thought she would be considering her mother passed away not long ago. When I first started the book I thought she was going to be depressing and moody, but thankfully she was not. Though I don't think I would have even thought about getting a job if my grandma told me I didn't have to but I guess I'm just lazy that way. Honestly I liked all the characters, well most of them, I did not care much for Iris or Ava but that was a no brainer. Alec, Rose and Charlotte were all great characters that added a lot to the story. Of course, I really liked Alec, I'm such a sucker for romance which is why I liked Alec so much. He brought out a side of Kat that she didn't really show to anyone else in the book so it helped to get to know her better. He also seemed to be one of the few that cared enough to ask how she was doing since her moms death, which made me like him more. Okay, I'll talk about all the magic now. Kat's magic was awesome and I am super jealous about that. I would almost give up my left arm to have telekinesis- almost I would think really hard about it, good thing I'm right handed. Anyway, it was kind of scary how quickly she got control over this power of hers, it just seemed like something that should have taken her a long time to control. I guess, that's what makes her even more of a badass though, the fact that she was just like "BAM, I got this." That ending though, was something else. I spent the entire book wondering what the heck was up with that beginning and then it became clear in the very last chapter. I loved the ending, well it was sad about Iris but she deserved it, kind of. I also loved how it paved the way for book two and it sounds like it's going to be another good one.